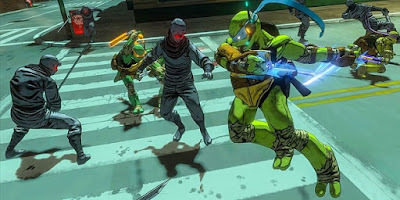 First we got a ratings leak, then a cover art leak, then we got an achievements leak, now we finally get some actual screenshots leaked for Platinum Games' upcoming Teenage Mutant Ninja Turtles: Mutants in Manhattan. The game still hasn't even been officially announced by either Activision or Platinum, but I can officially say it looks amazing. This looks to be the exact type of game I have been waiting for- a cel-shaded open world brawl-filled possible multiplayer funfest. If this game is anything near as good as Transformers: Devastation, it'll be something that might renew our hopes for the Teenage Mutant Ninja Turtles game franchise. This is probably the best looking, and yet completely unconfirmed game I've seen ever.